During the annual 2013 Golden Globe awards we tweeted, blogged, pinned, facebook'ed and instagram'ed live as Nicole Riche walked down the red carpet. Here is our breakdown of Nicole's 2013 Golden Globe awards look! 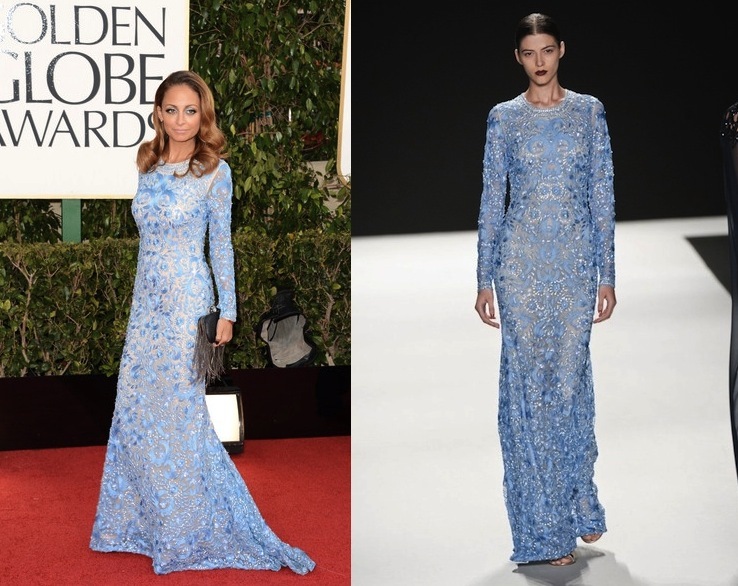 Nicole Richie wore a stunning Naeem Khan S/S13 blue floral threadwork and embroidered gown. Nicole's hair was so classic Hollywood with the soft wave created using Suave professional hair products. Her make-up was applied by Beau Nelson. He opted for an icy blue tone eye detail to compliment her Naeem Khan gown. Nicole carried a House Of Harlow 1960 fringed clutch. Nicole completed her red carpet look with a few statement rings and a deep/dark coloured plum nail.